Home / News / President Yamagiwa made a courtesy visit to the Rector of ｓBogor Agricultural University on December 1st. President Yamagiwa made a courtesy visit to the Rector of ｓBogor Agricultural University on December 1st. 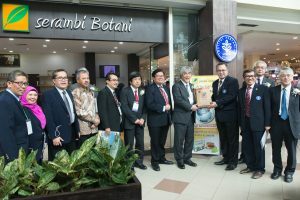 President Yamagiwa and other VIPs in Kyoto University made a courtesy visit to the Rector of Bogor Agricultural University ( IPB: Institut Pertanian Bogor) in the occasion of “Kyoto University International Symposium on Education and Research in Global Environmental Studies” held from 30th November to 2nd December 2018. The courtesy visit was made during 11:00 — 13:00 on December 1 at the special guest room in IICC (IPB International Convention Center) where the Symposium was held, and President Yamagiwa, an executive Vice-President Kayo Inaba, four Deans, and other VIPs joined from Kyoto University, while Rector Arif Satria, two vice-rectors, three deans, and other VIPs joined from IPB. 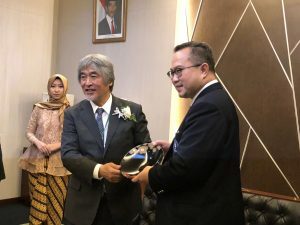 The visit started from introduction of IPB VIPs by Dr. Ernan Rustiadi and of Kyoto University VIPs by Prof. Shigeo Fujii, and was followed by Rector Arif’s welcome address and President Yamagiwa’s visit greeting. After discussion of both universities’ collaboration on education and research, President Yamagiwa and Rector Arif exchanged presents, and group photos were taken. Then, the members visited a shop in IICC, where IBP products are sold, and came back to the special guest room for discussion and lunch. 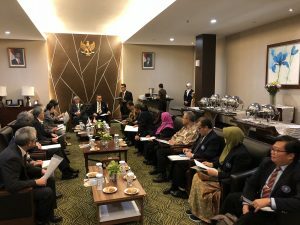 Kyoto University has already established a good relationship with IPB on education and research collation, and this visit may surely enhance much stronger relationship.